Above all the disciplines, seeking God is the most beneficial thing that we can do in life. There is nothing to be found outside of Him, and everything to be found in Him. It is easy to be distracted by the things in the life. We get distracted by all that we have to do for work and family. Distracted by the roles that we fill. We get distracted with numbers and budgets trying to make ends meet or reach our next goal. We get distracted in the things that we try to do to relax and unwind. We get wrapped up in the stuff that we have obtained. Eventually we lose focus on the one thing we should be seeking first, God. To let the busyness of life keep us from seeking God first, is one of the easiest tools we give Satan to use against us. If we fill our schedules without margin, it is easy for him to convince us that time with God, reading the Bible and praying can wait til later. When weeks become months and months become years, we often wonder how we drifted so far. God must be first in our time. He put us on His calendar, we need to keep Him on ours – not out of obligation, but out of relationship. Relationships are another area where we tend to get out of balance. We have filled our life with activities to occupy our children, when what they really need is time with God and time with us. God wants to be first place, no one before Him. He is a jealous God. When we put Him in first place, he will line up our marriages, our family roles, our friendship roles and every other role we play. Stuff is another thing that we allow to control us. We accumulate things for the sake of having, and end up with the things having us. We work for what we want, and then are so busy that we don’t have time to enjoy it. God wants us to give Him first place in our stuff. He may ask us to bless others with it, but ultimately He wants to bless us. If you don’t believe that God is okay with us having stuff, look at how he blessed Solomon, for desiring Godly wisdom above all. Finances is another area where God desires to be put first. Yes, I will say it, God wants your money. He doesn’t want leftovers, or what some call an offering. He asks for ten percent, but when you give it to Him, He blesses the other ninety percent. See we are called to bring the tithe, and give the offering. The tithe is God’s, offering is our gift. I have seen first-hand God take the nothing I have left over, and I not be able to make ends meet. And I have seen God take the tithe and offering, and bless what is left to where the ends not only meet but go around again. Interests is another area where God wants to be first. God wants us to have things that help us unwind and relax, but our interests shouldn’t replace Him, but draw us closer to Him. I doubt that golf, running, or painting would be qualified as godly. However, if we give them to Him, He will meet us on the gold course, the track or the canvas. We will find success in these areas if we allow Him to be first in them. 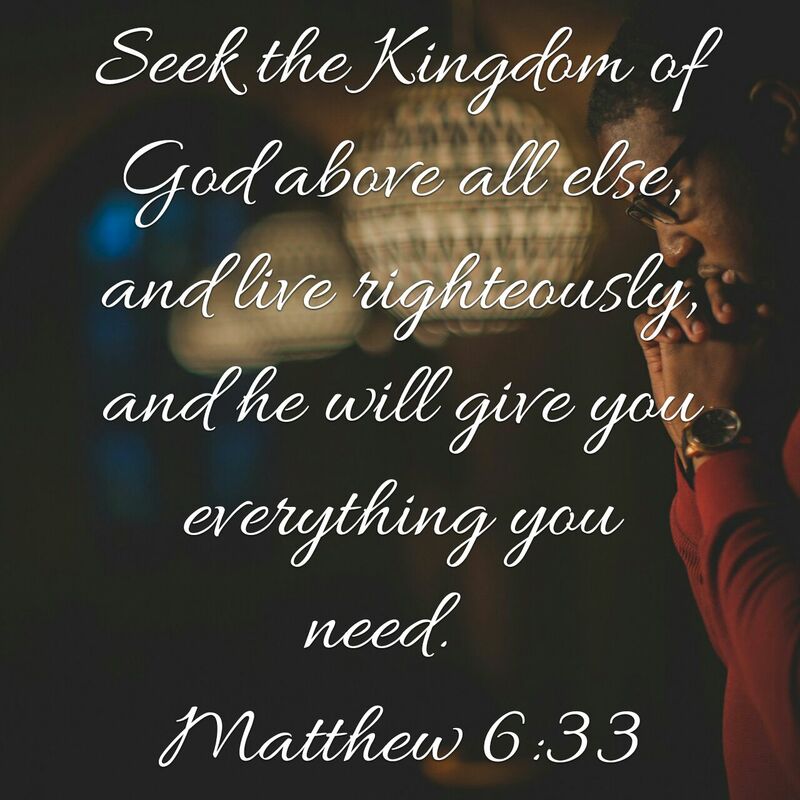 When we take time to discipline ourselves to seek Him first, to live in His righteousness provided to us through Christ Jesus, He will add everything else to us that we need to live the abundant life He called us too. This entry was posted in Faith and tagged #OneWord, #Write31Days, Lessons, Scripture. Bookmark the permalink.